If you’ve never done a quilt along before, join the club! I have never participated in one because I have so much going on that I didn’t feel I could commit to finish. Then I found a link on twitter to a super easy quilt along hosted by Melanie of Above All Fabric. 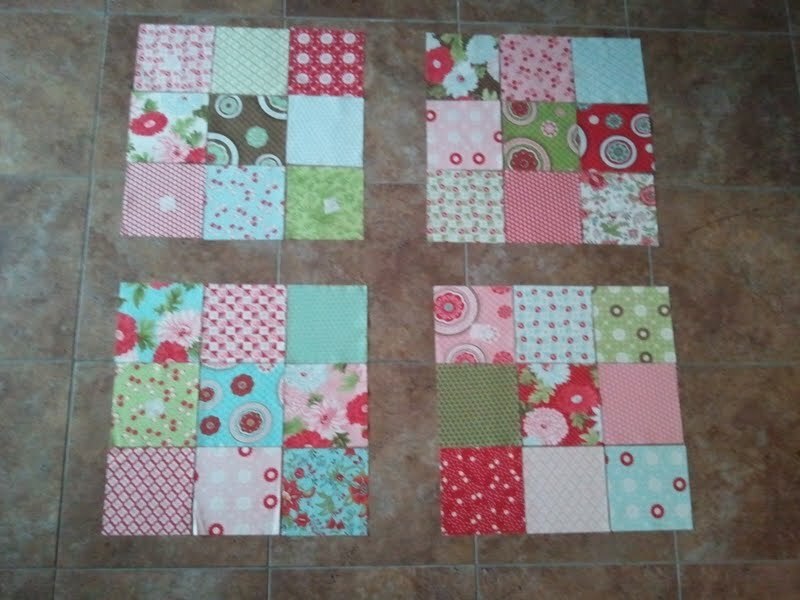 All it takes is a charm pack (pre-cut 5-inch squares of fabric), 3/4 of yard for sashing, and another 1/2 yard each for borders and binding. And the best part? It only takes a week! The fabric line I chose for mine is “Bliss” by Bonnie and Camille for Moda. I love this line and I already had a charm pack so I didn’t have to buy any fabric for this quilt (which, I’m not gonna lie… that helped in my decision to make it!). After we’re done making the quilt, we’re also going to be making a bag to go with it. If you want to join in, it’s not too late. Our First Ever Giveaway Post! I have decided that I want to do a little remodel of our blog. I read all kinds of crafty blogs from all over and in comparison I find the look of ours to be a little, well, blah. I want pretty colors, fancy links to awesome crafty stuff and wonderful crafty people, and to use it to promote others a bit more. Before I begin the process though, I’m going to need some feedback. That’s where the giveaway comes in. I have been hesitant to do a giveaway, but after much deliberation (read: deciding what I could stand to part with from my treasured stash) I have decided to go ahead and have one. My question would be this: What makes you return to the same blog time and again? Is it because of all the wonderful links, the aesthetics, or the writing? Maybe you like blogs for their inspiration. Or maybe the thought of winning a prize entices you. Speaking of prizes, you probably want to know what this one is! 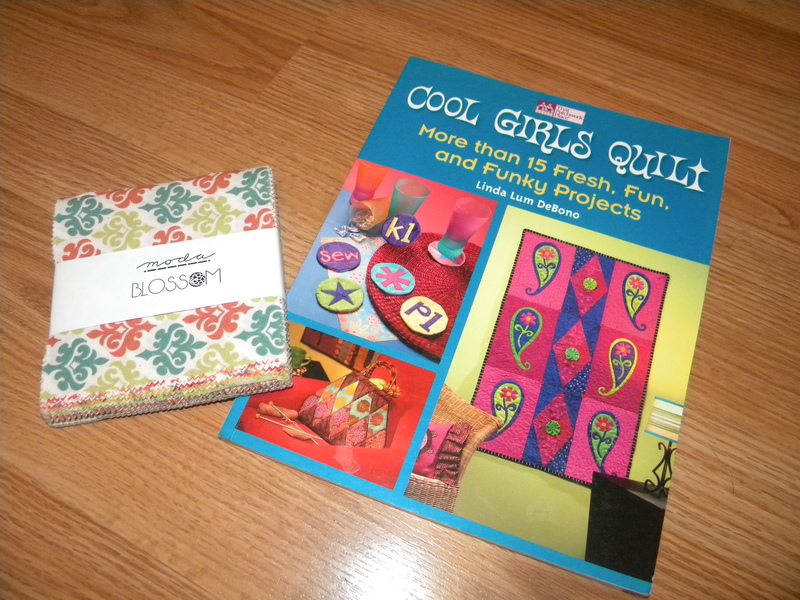 It’s a charm pack of Blossom by Moda Fabrics and a really great book called Cool Girls Quilt by Linda Lum DeBono. It’s got some cute projects in it that are perfect for beginners as well as more seasoned sewists. What are your favorite things to see on a blog? It could be photos, tutorials, links to other blogs, prizes… lots of things. Here is the giveaway criteria… Leave a comment for us and let us know what keeps you coming back to read a blog. That’s all! One entry per person and duplicate entries will be deleted. I’ll choose a random winner on Wednesday January 26th. The more we hear from you, the better our blog will be when I’m done snazzing it up! Good luck! I visited this adorable quilt shop in Chehalis last weekend. My husband made me go for a car show, so naturally I pulled out my phone and googled ‘quilt shops in Chehalis, WA’. Lucky me, I found two! The Quilters Junction was not my favorite, but the people there were very friendly. The one I just loved was called ‘Sisters’. It was difficult to get to with all the weird one way streets in downtown, but once I finally found it, I fell in love. They had the most beautiful quilts hanging everywhere. I really had to control myself to not buy everything I saw. Just when I thought that I was going to make it out of there with nothing but an eight dollar pattern, I found the sale basket… I ended up spending over sixty dollars because of that damn sale basket! However, I ended up getting A LOT of really great things for much less than I would have otherwise. 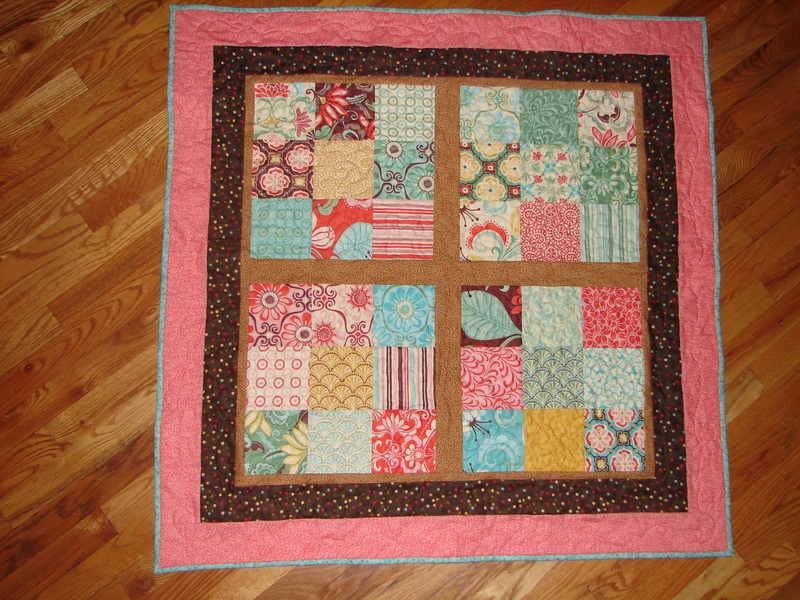 Now that my daughter’s birthday quilt is complete I need to make time to sew, sew, sew! My husband has made me put all that on hold. We are getting the house ready and even though we have at least 9 months to go, we have quite a bit to do. The last few days have been spent painting the outside of the house. Granted, the hubs has done most of the work, but I get to paint the trim, which I hate because that also means lots of blue painters tape. I painted a bit of trim today and did quite a bit of running errands. I stopped at the fabric store on my way home though (of course) and got a charm pack because they’re just so fun, and 4 yards of fabric because it was pretty. This fabric buying thing has really gotten out of control. It used to be that I’d buy fabric when I needed it for something specific. I’d buy on a whim occasionally. 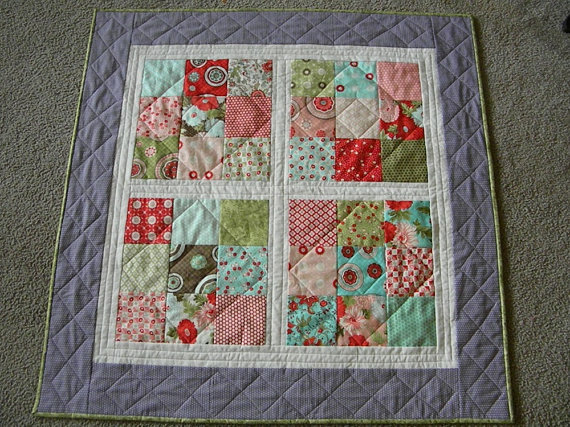 Lizze has introduced me to something called quilt kits though, and now I cannot get enough. Up until a year and a half ago, I wasn’t aware that such things existed. I’d buy a yard of this, and a yard of that… Now I can get all I need in one package including the pattern, and I don’t have to choose fabrics! This, to me, is amazing. I have a serious problem. My name is Selina and I am a fabricaholic.